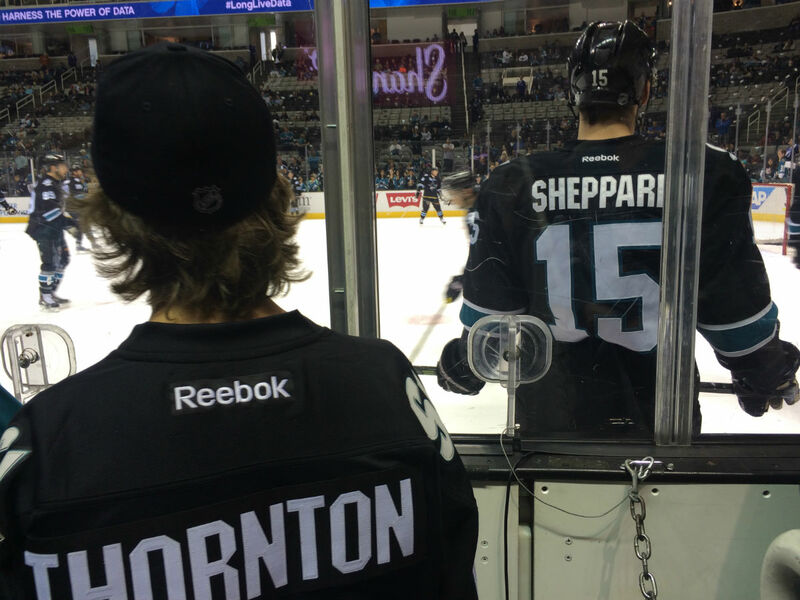 Ryan watches the Sharks warm up. The words are not mine, but they echo in my head as if they were. I am trying to force myself to take a mental picture of all that we are experiencing, so that I may remember it forever. So that I may capture and describe it later. But try as I might, the clock keeps racing onward. The game will not pause and allow me to drink it in, every delicious second, every frenetic shift. I check the game clock more often than a nervous coach. The words are not in my voice. They are in the voice of Liev Schreiber, the actor and narrator of HBO’s “24/7” sport documentaries. These words, written by Aaron Cohen, came at the end of the first hockey-themed edition of that series, about the buildup to the Capitals-Penguins NHL Winter Classic on Jan. 1, 2011. I silently curse Cohen and Schreiber. Why won’t this game hold still? Of the many dozens we have experienced together, why does this one feel like it’s taking place in fast-forward? I know why. Veronica, to my right, knows why. Her tears say why. Riley, between us, wearing a jersey borrowed from her brother for the day, knows why. 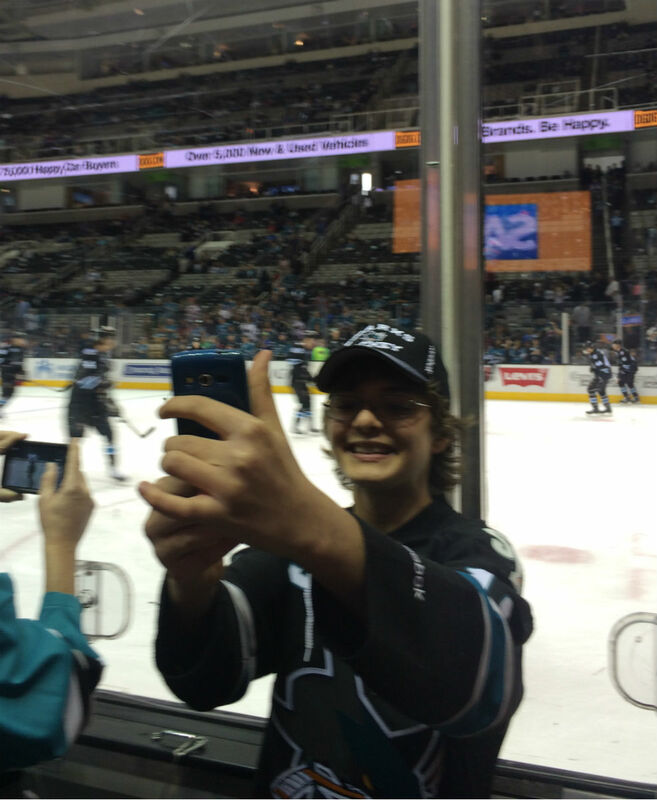 It is because this game, of all those we have experienced, is the first one at SAP Center. 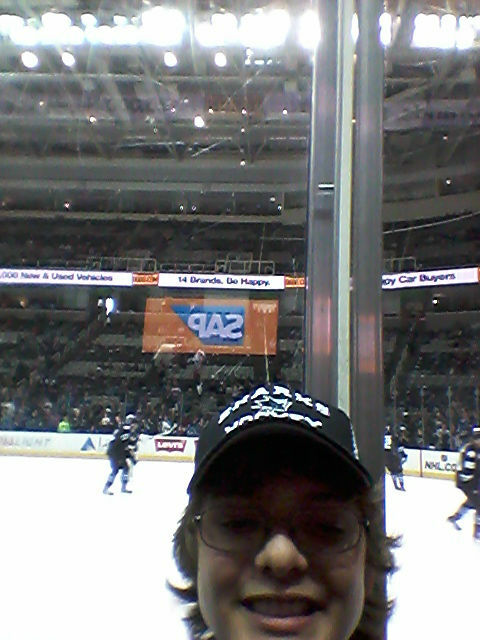 On my left, Ryan wills his beloved Sharks on, even as they sit on the wrong side of what will become a 5-2 loss. I may have seen him as happy as when we set foot in the arena a few hours before. I know I have never seen him happier. Sure, we’ve done road trips before. But not like this. Not with this obstacle course of six-hour flights and three-hour time changes and multiple hotel rooms and restaurants for every meal and no weighted blanket and days spent sightseeing so that his sister might have her day on the trip as well. We’ve been chasing this trip for what, five years? Six? None of us is quite sure when or why Ryan became a Sharks fan, but it has been at least that long. And in each of those years Ryan asked when we could go see them play a home game in San Jose. Early on, I would roll my eyes and tell him that San Jose was a six-hour flight away. Neither of us thought that would work very well, and that usually ended the conversation. Truth is, a six-hour flight was simply not an option then — for either of us. But like a mountaineer acclimatizing on Everest, Ryan built up to this, increasing his stamina with successive journeys. Along the way, he packed his tool kit with the skills that would help him. He became more flexible with his routines. He learned to love sports movies (helpful for the long flight). His sleep patterns became more adaptable. At some point last year, I knew we were ready. And so when the 2014-15 NHL schedule was released, we immediately found our date: a Presidents’ Day weekend trip. Still, it was with no small amount of anxiety that we headed to the airport. Winter flights in the northeast have a nasty habit of getting delayed or cancelled. That’s traumatic enough when the stakes are a family visit. But a first-ever chance to experience his most favorite thing in the world? We checked the weather and crossed our fingers. Our fears were unfounded. He was OK on the flight until the final moments. He handled the time change and a few wrinkles in our travel plans. He even enjoyed himself sightseeing in San Francisco. His expanding diet made restaurants a breeze. All of which lead us to these seats, in this arena, in the third period of this game, with the clock advancing towards zero at rapid pace. Eventually, I give up the hopeless pursuit of stopping time. Try as I might, this evening, this experience will not last forever. And so I begin to think about how I will document it. I check the pictures on my phone during intermissions. Do I have the perfect shot? Have I adequately recorded this amazing day for posterity? The one that began with a tour of team’s practice facility and family photos in the Sharks locker room? That continued with a private tour of the arena, a meal at the restaurant on the club level, and an ice-side view of pregame warmups? That included fist bumps with the players as they headed to the ice through the famous Sharks’ head for the game? That will end with yet more visits with the players and team management? Or when Sharks’ forward Patrick Marleau, who addressed Ryan by name the last time we met with the Sharks, shook his hand during the fist-bump line? Or when we bound up the steps and into the arena bowl just ahead of the opening face-off, pausing to listen to the last words of the national anthem. Veronica placed her hand on my shoulder. I reached back and held it and fought off tears. As is so often the case in these moments, no words were needed to convey the enormity of that moment. Even Riley remarked at what her brother must have felt. Joy, and excitement, that was only slightly dampened by the final score. And when I get back to that question of how to document this day, this weekend, this experience, this trip, this MOMENT, and when I look through my dozens of dimly lit and out-of-focus photos, I find it. I find the one that summed up for me exactly what this experience meant for Ryan. Ryan takes a selfie during pregame warmups. Well, not exactly. It was a photo of Ryan taking a selfie. I had seen him take one maybe once before. But as we stood by the glass for warmups, and as he called out to his favorite players, and as his smile lit up the arena, he paused. He turned his back to the ice, and held out his arm in the now familiar pose, snapping a picture of himself with the Sharks in the background. I have speculated before about the rare moments when Ryan takes pictures. I can think of no greater statement on how much the experience meant to him that Ryan chose to document it in this matter. Maybe Cohen and Schreiber were wrong. Hockey won’t hold still for a portrait? Ryan, making hockey stand still for a portrait. My sincerest thank you to everyone at the Sharks organization who made our visit so unforgettable.You have given us a memory we will cherish forever. Wow. I am wiping away my own tears. I get it. And I’m so happy for you all. I have got to quit reading your blog at lunch. Crying in your office when you are in a cube isn’t what big girls do. So thrilled it was a wonderful trip. I can’t wait to get all the details from Ryan.